Shakespeare: Oh, Kate, don't go there. Lady-acting is illegal. Beside which, girls can't act. Just as they cannot practise law, cure the sick, handle financial matters or stand for any office. Kate: But no woman has ever been allowed to try any of those things! Shakespeare: Because they can't do them! God's bodikins, Kate, what's not to get? Now, please, forget this nonsense and let me focus. The idea (and historical reality) that women should be limited from playing female roles is now ludicrous to the point that it has become fodder for satire. Today, not only are women permitted to act, practise law, cure the sick, handle financial matters and run for office, they have become leaders in these roles. In medicine and biomedical science, this is apparent. Last week I turned on the radio to hear Wendy Barclay talking about her work in the field of virology on the life scientific. Professor Jane Dacre is president of the Royal College of Physicians, and in 2014 Dame Claire Marx became the first female president of the Royal College of Surgeons. In every hospital specialty women are now represented, and this is of no small importance. In conversation with my peers and in the literature 1, a common theme is that the presence of female role models is instrumental in encouraging women to push professional boundaries. More personally, reading Frances Ashcroft’s popular book on electrophysiology, ‘The Spark of Life’, not only inspired me to apply to medical school, but to undertake a project in electrophysiology during my BSc year despite being the only woman in my lab. And yet, though 55% of medical students are women, women fail to be represented to the same proportion as their graduating class, with only 34% of consultants in the UK being women2. In medical education and academia3, the proportion of women in senior roles doesn’t even approach 50%. Furthermore, gender related preconceptions persist. At a recent teaching awards ceremony at my own medical school, the nine teaching excellence awards went to male doctors, and the two pastoral care awards were given to female doctors. These were awards nominated and voted on by medical students – demonstrating that at my place of study at least, the preconception that men are better teachers, whilst women are more caring, lingers amongst students and in the trust in which we are studying. In discussion about this with a colleague, his response was that ‘perhaps the male consultants are better at communicating tricky concepts to students’ – not exactly a far cry from to the fictional Shakespeare’s response above. The term ‘glass ceiling’ was coined almost 40 years ago in reference to the sometimes invisible barriers to success women encounter in their careers. Persisting attitudes and the decrease in female representation up the training grades suggests that, at least in part, this ceiling still exists for women pursuing a career in medicine. However, the increasing numbers of women in senior roles suggests the barrier may be weakening – some, and an increasing number, are breaking through to the top. One barrier to career progression women encounter, which I think is not so much ‘glass’ as something more opaque, is the fact that only females are able to become pregnant and breastfeed. However, an aspect of child-rearing in which a ‘glass’ component exists is in the subtle assumption the mother of a child should be the primary care giver. Changes in the law allowing the fathers to share parental leave with their partners, and the increase in men working part time to share the childcare more evenly, suggests this too is changing – though perhaps not quickly enough. In Elizabethan England, the ceiling restricting the advancement of women was more concrete (or timber) than glass. Despite later empowerment of women, a ceiling persisted into the 21st century, preventing women excelling to their full potential. In my opinion, that ceiling exists still for women in the medical profession; though I no longer feel it is impenetrable. Perhaps a jelly (or agar) ceiling is a better metaphor for the situation now. Though they require more determination, my female colleagues ahead of me are slowly pushing through and weakening the barrier, forging the way for me and my peers. 1. Kapila, D. Female role models in medicine: a medical student’s perspective., Female role models in medicine: a medical student’s perspective. J. Adv. Med. Educ. Prof. J. Adv. Med. Educ. Prof. 6, 6, 49, 49–50 (2018). 2. Women and medical leadership infographics. The King’s Fund Available at: https://www.kingsfund.org.uk/audio-video/women-and-medical-leadership-infographics. 3. Equality in higher education: statistical report 2013. Equality Challenge Unit Available at: https://www.ecu.ac.uk/publications/equality-in-higher-education-statistical-report-2013/. This essay discusses that the budget should be distributed to invest in community care. This includes the funding of allied health professionals and social care to promote the development of an integrated care service and therefore promote the health and wellbeing of patients. The underlying priority is to create a healthcare system in which it is uncommon for a patient to reach crisis point, be that physical, mental, social or a combination of these,and hence require admission to stabilise them. In the United Kingdom there is an increasing elderly population which in turn is putting new strains on our provision of healthcare and healthcare budget. Elderly patients are more likely to have chronic health conditions and have more complex healthcare needs that benefit from a multidisciplinary team approach. In addition to the expanding elderly population, there are still younger patients with complex health needs and adding to this, patients are contracting chronic health conditions at an earlier stage in life which is putting increased strain on the system. Although the health system is already striving to provide an integrated service, it relies on many healthcare professionals providing separate services to a patient but also collaborating to ensure that each patient is provided with an optimum personalised care package that focuses on their individual needs. Currently, this service is not available in the way that would be beneficial to both patients and healthcare workers, and one of the reasons for this is that there is not enough funding in the community to provide a truly integrated service, or enough time in health professionals schedules to allow collaboration between individuals in different services. An integrated service would comprise of true collaborative practice between general practitioners, consultants based in the community, district nurses, allied health professionals and social care to provide best possible care for all patients, but especially those with complex care needs. This would require regular multidisciplinary meetings between these professionals to discuss individualised patient care plans and prioritise patient safety issues should they arise alongside working with patients in the community and at more regular intervals than is currently possible. Therefore money invested would have to be partly used to increase the workforce numbers in the community of these professionals to allow time for the services to meet to discuss patient needs and develop personalised care plans, but also to develop a system which would nourish this approach. It is important to note that investing money into community care and a better integrated healthcare approach would not only benefit those working in the community but those working in hospitals also. If patients are better cared for in the community, their healthcare needs can be understood and therefore are more likely to be met, the service is providing preventive medicine. This means that patients are less likely to be admitted into hospital, and if admission is needed there are less reasons for delay in discharge back into the community. This then means that there will both be less patients in hospitals and increased flow within them, and so there will be less pressure on beds. There will be shorter waiting lists if there are less acute patients to require hospital time, and therefore this time may be spent in routine clinics, which will further add to an integrated health care approach. This may also mean that healthcare professionals in hospitals are able to offer better patient care to inpatients. Although not previously mentioned, as part of the integrated care plan, investment is needed in hospitals to provide training and time to allow healthcare workers in hospitals to communicate effectively with the community team caring for each patient, both on admission to understand patient history and needs, and on discharge to ensure the individual plan is amended to allow smooth transition into the community and therefore prevent readmission. In conclusion, prioritising integrated care by investing money into community services and social care could both increase health and wellbeing of patients in the community but also reduce preventable admissions into hospital, having further effects on inpatient care. Investing in preventive medicine, although costly in the short term, may both reduce money spent on acute healthcare in the future and will improve the physical and mental health of patients: something that everyone working in healthcare should have as their main priority. Katherine Branson Student Essay Competition - Open! Details: Submit an essay of 600-800 words and you could win £100! Wellbeing of doctors is vital to quality of care for patients: How should it be taught in Medical Schools? Prize: £100 (for each essay) and an invitation to present your winning essay at our Spring Conference. 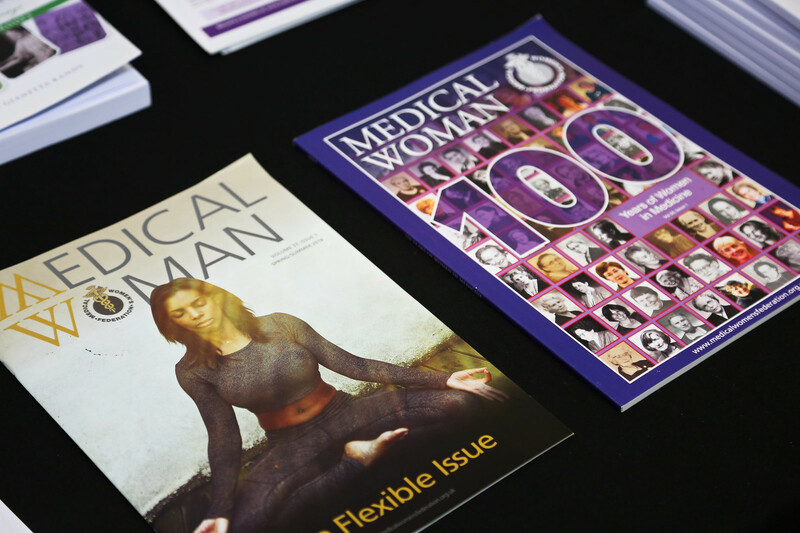 "Medical Women Leading the NHS"
We are excited to announce the Medical Woman Front Cover Competition, the winner of which will have their artwork or photography proudly displayed on the cover of our magazine Medical Woman: The only Magazine for Women in Medicine. The theme is: "Medical Women Leading the NHS"
Please submit a painting, drawing, photograph, cartoon etc; Anything which you think fits the theme and would look great as a magazine cover image. Please bear in mind that the magazine is A4 and images have to be submitted in a digital form in the highest quality possible. The closing date is Monday 26th January. Mature Student Grant Applications 2014 - Open! Katherine Branson Essay Competition - Open!